Blimey, January’s dragging on a bit, isn’t it? Going to paste yesterday’s column below and then make myself my 73rd cup of tea to warm up. I might go mad and have a chocolate Lindor ball with it. It’s that sort of day. It was Francis Maude who first uttered the words ‘kitchen supper’ back in 2012 when he was describing the cosy dinners David Cameron (remember him?) would throw at No. 10 for party donors. Cue was sniggering on the left about ‘bought’ lasagne but tacit agreement on the right that, actually, kitchen suppers were a practical idea since the dining room could be jolly cold and it was such a bore to get the silver out. It is a loathsome phrase, but it was to my friend’s kitchen that I went for a bowl of pasta last week. The usual January rules applied. Only a small bowl of pasta (no seconds), one glass of wine tops and perhaps something murder-y on the telly afterwards. Home and in bed by 11pm. Ideal. But it was just as my friend Emily had put her children down and put a pan of hot water on the hob that the doorbell went. ‘Oh yes, that’ll be Daniella,’ said Emily. ‘Who’s Daniella?’ I asked, feeling put out. I’d never heard of her and I was practically in my pyjamas. This was supposed to be an evening where we grunted at one another over the penne. Turns out, Daniella was the woman Emily had booked to come over and inject botox into her forehead, between putting her babies down and whipping up supper. So Emily sat beside her kitchen island while her husband uncorked a bottle of chardonnay and Daniella lined up her needles. Twenty minutes later it was all over and Em was rummaging in the fridge for pesto. I waited for a sensation of shock, to feel outraged and dismayed that this is what it’s come to – women having to squeeze in home appointments to make their foreheads as smooth as a bowl of custard between babies and supper. But nothing came. I didn’t feel appalled. If I’m totally honest, I felt grateful. I realised that I’d much rather discuss a friend’s wrinkle regime than hear one more person mention Dry January or tell me how their bowels are faring on a vegan diet. You may feel this is The Thin End Of The Wedge. If you’re the sort of person who thinks women shouldn’t apply make-up on the tube, then I fear your monocle might have dropped out at the idea of botox administered from the kitchen island. But it may be, she says callously, one of those ‘generational’ things. When I was about seven, I remember my parents coming home from a charity dinner and saying, in shocked tones, that the Duchess of York had refreshed her lipstick at the table. Quick, fetch the police! These days, I don’t think we need to fall about in shock at people being more open about their beauty regimes. It’s much more honest to have botox in front of mates rather than pretend you’re blessed with freakishly youthful skin. A friend tells me his wife holds court on Saturday mornings while having a pedicure. Why should the rest of us be appalled, if the person in question is so sanguine about it? I might blanche if certain waxing procedures happened on the kitchen table, but if there was a bowl of pasta afterwards I think I’d get over it. I don’t know if Francis Maude and David Cameron were having a manicure or their eyebrows done in the kitchen at No. 10, but I wouldn’t blame them if they were. An eminently sensible use of time, I reckon. 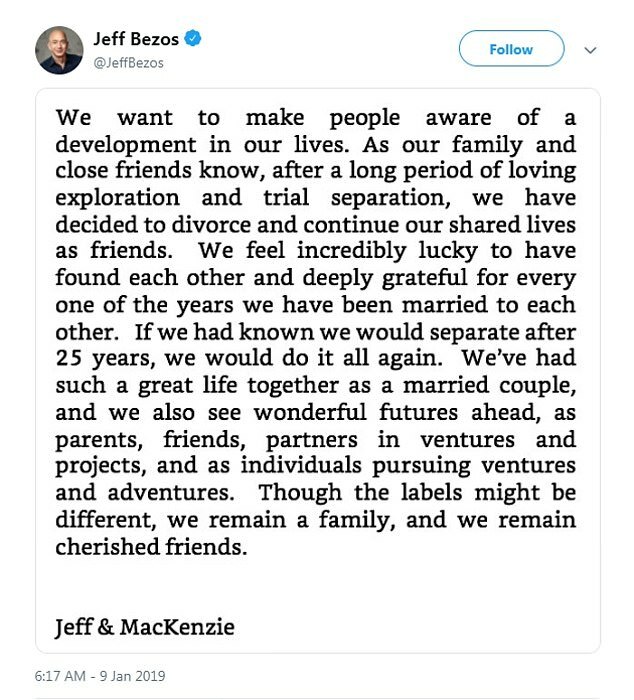 There’s been plenty of sniggering in the past week about Jeff Bezos, Mr Amazon, and his split from his wife, MacKenzie. Bezos was apparently about to be exposed by an American magazine for an affair with a younger news presenter and so he and MacKenzie have announced their divorce. Alright he’s sent his girlfriend some, ahem, intimate photos and questionable text messages (‘I love you, alive girl’), but – nudie pics aside – I almost wept at the statement he and his ex-wife issued. ‘If we had known we would separate after 25 years, we would do it all over again,’ they said. As someone who comes from a family of divorces, I found this a hugely charming thing to say. Who knows whether they’ll be as civilised over the $137b fortune, but for their statement alone, I salute them. I’ve come over a bit Lady Bracknell this week after reading an alarming news story. According to the Office for National Statistics, more children are conceived on Christmas Day than at any other time of the year. WHAT? Why aren’t you all lolling on the sofa after a big lunch? I’ve got plenty of friends who have September birthdays and call themselves ‘New Year’ babies, which is slightly more understandable. But Christmas Day itself? Of all the days in the calendar, this is hardly the one to be peeling your clothes off. You’ve just swallowed 73 pigs-in-blankets, for heavens’ sake! No no no, if you want to get your heartrate up on Christmas Day, it’s out into the bracing fresh air for a walk after a game of Scrabble. Far more sensible.